The 1950s was the decade of Elvis Presley, and although it was 1954 before he emerged onto the scene, no other artiste sold more records between 1950 and 1959. But who came second? Not many people would now correctly name that singer as Perry Como. Como was a world away from Elvis, a crooner who started his career in the early 1930s, but he was the first singer to embrace the then new world of television. Between 1948 and 1963, The Perry Como Show was a weekly staple on American TV and throughout the world. The shows provided Como with a platform for light-hearted, novelty songs, now much derided by highbrow critics. They were perfect for television, with Como’s producers often converting them into production numbers that in truth, were the first pop music videos. Como’s standing as king of television offered him the perfect vehicle to market his records and a string of hit singles, including several US and UK number ones came his way during the Fifties, but the record for which he is best remembered - “Magic Moments” - began an 8-week stint at the top of the UK Hit Parade in February 1958. “Magic Moments” was the product of a new songwriting team of Burt Bacharach and Hal David and was their second hit record. The first - “The Story Of My Life” - was a UK number one for Michael Holliday, and when Como’s “Magic Moments” displaced it, Bacharach and David were onto a ten-week stay at the top of the British charts. But it might never have happened. Back in the Fifties, singles invariably offered an A and a B side. The A side was the song that the record company wanted to promote, and the B side was frequently an inferior piece, very much a filler for a two-track, two-sided record. Occasionally, record companies found themselves with a “Double A-side” single, sometimes by design, sometimes by accident. Como’s RCA Victor release of “Catch A Falling Star” and “Magic Moments” was a classic example of the double A-side. Como recorded “Catch A Falling Star” first in October 1957, and it was that side RCA plugged most strongly in the USA. The product of another new songwriting partnership, Lee Pockriss and Paul Vance, the song gave Como his thirteenth No. 1 record in the American Billboard charts. 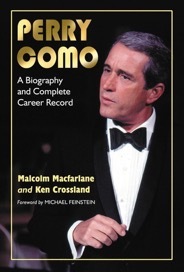 It would be the last Como record to reach the top spot, but more significantly, it became the first Gold Record awarded by the Recording Industry Association of American (RIAA) to any performer, and later in the year, it earned Perry Como the first, newly launched Grammy Award For Best Male Vocal Performance of the Year. Billboard ran charts that reflected both record sales and disc jockey plays. “Catch A Falling Star” might have hit No. 1 but its flip side, “Magic Moments” hit No. 4 in the disc jockey chart, and when the single was released in the UK in January 1958, it was “Magic Moments” that stole the honours. It reached No. 1 on February 28 and stayed there for 8 weeks. “Catch A Falling Star” also earned a Top 10 spot in Britain, reaching No. 9 during the last week of March. Both of the songs are shoo-ins for any Perry Como compilation CD. What is much less commonly heard is an unissued alternate take of “Magic Moments” from Como’s New York recording session on December 3, 1957. The issued take that earned the chart honours was number 8 in the session, but despite having that one in the “can”, session producer Joe Carlton was keen to experiment with different permutations of Hal David’s lyric. The recording engineer’s announcement tells us that the alternate was “take 20”. It doesn’t have the commercial edge that take 8 had, but the comparison is interesting. Click on the links below and hear the two versions side by side.